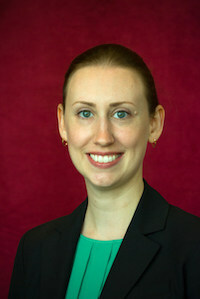 Dr. Lynnsey Weissenberger, alumna of the School of Information master’s and doctoral programs in Library and Information Studies, has been awarded a Marie Skłodowska-Curie Actions (MSCA) Individual Fellowship for two years of postdoctoral research in the European Union. The highly-competitive fellowship scheme attracts researchers who are mobile, meaning they are able to live and work within the European Union to conduct innovative research, gain valuable new skills, promote the value of research to society, and contribute to the future innovative capacity of their employers. In 2017, there was around a 13% success rate for MSCA applicants. Weissenberger’s research project, LITMUS (Linked Irish Traditional Music) will focus on the development of the first linked data ontology specifically to address the needs of Irish traditional song, instrumental music and dance, and by extension serve as a reference point for other Linked Data projects involving orally-based music traditions. Irish traditional music is shared primarily through oral transmission, which presents unique challenges. During the two year project, Weissenberger will work at the Irish Traditional Music Archive (ITMA) in Dublin, Ireland. ITMA is the national archive for traditional song, music and dance of Ireland. While there, she will collaborate in the selection of materials and development of the linked data ontology and framework. She will also have the opportunity to spend several months with the INSIGHT Centre for Data Analytics to learn industry applications for linked data, working with their team based at National University of Ireland, Galway. LITMUS is an extension of Weissenberger’s previous research and doctoral dissertation, which examined the current approaches to music information in library and information retrieval areas. She found these areas are ill-equipped to handle cross-cultural expressions of music practice. Her research has won accolades at the 2017 ALISE conference and earned her the opportunity to serve as a visiting scholar at Middlebury College in Vermont. While at Middlebury, she’ll lecture on music traditions and information technology in the changing world. The topic of her work is near to her heart. Weissenberger plays the fiddle, harp and tenor banjo, and uses her music ability to share traditional Irish music. From 2010-2015, Weissenberger served as director of FSU’s Irish Music Ensemble. Find a sampling of her performances with the Irish Music Ensemble on Soundcloud. “ITMA staff are all Irish musicians, and have a deep knowledge of–and respect for–traditional music, song, and dance. I look forward to learning from them as we enable wider access to their collections for future research and exploration,” said Weissenberger. For more information, visit the Irish Traditional Music Archive and Dr. Weissenberger’s website lynnseyweissenberger.com. Posted in CCI News, CCI Research News, international programs, iSchool Alumni News, iSchool News, iSchool Research News.